Here's another Easter card for you, as I'm recovering from my surgery. This was my very first project for the My Creative Time Design Team, back in January of 2011! I showcased the My Creative Time's "Color Me Happy" stamp set. All of Emma's stamp sets are adorable, and this one is no exception. 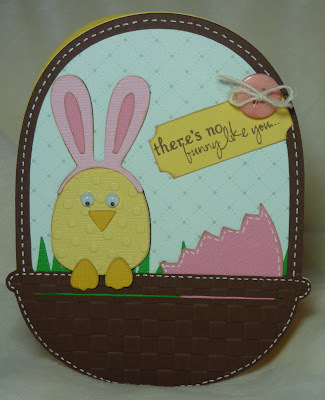 For this card I chose the "there's no bunny like you" stamp because I thought it was a perfect match for a little bird dressed up as a bunny. To make this card, I used my Gypsy to weld together two 5.21" baskets from the Create a Critter cartridge and then cut them on yellow cardstock, "hiding" all inner cuts. Next I cut a patterned paper layer, again hiding the inner cuts. The brown basket was cut normally (all baskets were cut at 5.21"), and I ran it through the Squares Cuttlebug folder. The grass is from the Easter 2010 cartridge, and I welded two of them together, cutting them at 1.5". For the "bunny bird", I used 3 Birds on Parade, and cut it at 3". 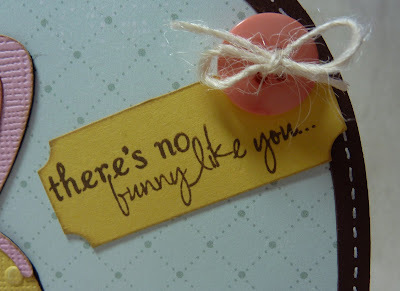 sooo cute, like the sentiment!! Love your card. The colors are perfect. Hope you are feeling better today. YOur card is adorable!! Hope you are feeling better. So cute!! I hope everything is going great with you and you are feeling better!! MCT 3-D Wednesday & a Winner!